Aim The increasing rate of all-cause dementia worldwide and the lack of effective pharmaceutical treatments emphasise the value of lifestyle approaches as prevention strategies. Emerging evidence suggests sedentary behaviour is associated with impaired cognitive function. A better understanding of this association would significantly add to our knowledge of how to best promote healthy cognitive ageing. 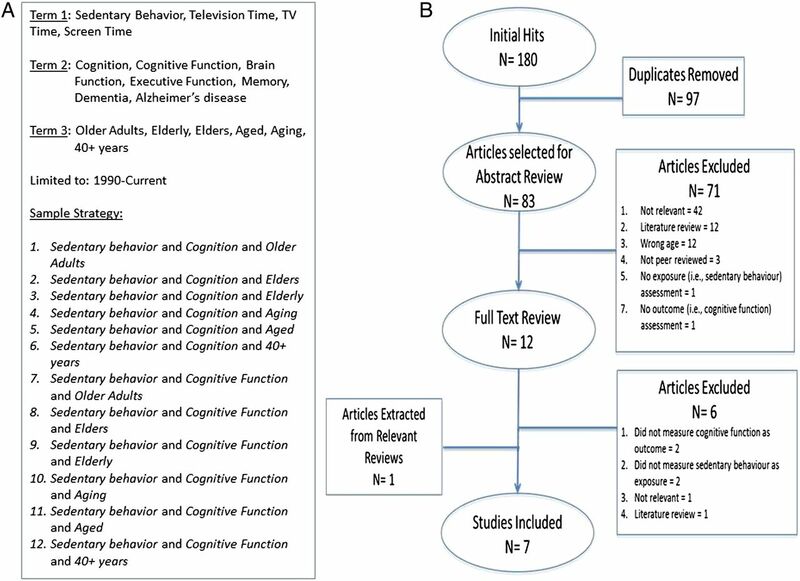 Thus, we conducted a systematic review ascertaining the contribution of sedentary behaviour towards associated changes in cognitive function over the adult lifespan. Study design Systematic review of peer-reviewed literature examining the association of sedentary behaviour with cognition. Data sources We searched PubMed, PsycINFO, EBSCO and Web of Science, and reference lists of relevant reviews on sedentary behaviour. Two independent reviewers extracted (1) study characteristics and (2) information regarding measurement of sedentary behaviour and cognitive function. We also assessed study quality using the Strengthening the Reporting of Observational Studies in Epidemiology (STROBE) checklist. Eligibility criteria We limited search results to adults ≥40 years, observational studies published in English since 1990 and studies investigating associations between sedentary behaviour and cognitive function. Results 8 studies examined the association of sedentary behaviour with cognitive function. 6 studies reported significant negative associations between sedentary behaviour and cognitive function. 8 different measures of sedentary behaviour and 13 different measures of cognitive function were used across all eight studies. Summary Sedentary behaviour is associated with lower cognitive performance, although the attributable risk of sedentary time to all-cause dementia incidence is unclear. Our systematic review provides evidence that limiting sedentary time and concomitantly engaging in regular moderate-to-vigorous physical activity may best promote healthy cognitive ageing. Currently, one new case of all-cause dementia is detected every 4 seconds around the world.1 All-cause dementia prevalence is also expected to rise since the number one risk factor is age2 and the number of older adults worldwide is increasing.3 Thus, the current lack of effective pharmaceutical treatments for all-cause dementia is creating an urgency to develop non-pharmacological strategies to prevent, or at least delay, the onset and progression of the disease.4 As a result, lifestyle approaches have become an important line of scientific inquiry and public interest. While preliminary evidence suggests sedentary behaviour is associated with cognitive function, it is still unclear what the magnitude of this association is. For example, it is unclear if reducing sedentary behaviour is more important for long-term cognitive health than increasing physical activity. Such empirical evidence is crucial to increasing our understanding of how we can best promote healthy cognitive ageing through lifestyle approaches and determining whether public health should focus on reducing sedentary behaviour, increasing moderate-to-vigorous physical activity or both to reduce all-cause dementia prevalence. Thus, our objective was to systematically review the epidemiological evidence regarding how sedentary behaviour is associated with cognitive function throughout the adult lifespan. We conducted a systematic review regarding the association between sedentary behaviour and cognitive function. In accordance with the Preferred Reporting Items for Systematic Reviews and Meta-Analyses (PRISMA) statement,21 we searched PubMed, PsycINFO, EBSCO and Web of Science between 1 January 1990 and 6 February 2016. Included in our search terms were the following keywords: sedentary behaviour terms (sedentary behaviour, physical inactivity, television time, TV time, screen time); cognition terms (cognition, cognitive function, brain function, executive function, memory, dementia, Alzheimer's disease) and age terms (older adults, elders, elderly, ageing, aged, 40+ years). This process was repeated until all search term combinations were performed. A sample of the search strategy used for studies investigating the association between sedentary behaviour and cognitive function is provided in figure 1A. (A) Simplified search strategy. (B) Flow chart of study selection. We selected peer-reviewed, published and observational studies that included adults aged 40 years and older that measured sedentary behaviour as an exposure and cognitive function as an outcome. Articles mentioning sedentary behaviour and cognition in either the title or abstract were initially included for full-text review. We included studies if they were (1) observational studies (ie, cohort, case-control or cross-sectional); (2) peer reviewed and (3) published in the English language between 1 January 1990 and 6 February 2016. All studies included clearly described participants as adults aged 40 years and older at baseline assessment and measured sedentary behaviour at baseline assessment or over time with the purpose of assessing risk (ie, exposure). Additionally, the studies included measured cognitive function at baseline assessment or over time with the purpose of determining change associated with increased sedentary behaviour (ie, outcome). We excluded articles if they were (1) not peer reviewed and (2) not published in the English language. Since we were only interested in observational studies, interventions designed to reduce sedentary behaviour were not included. Two authors (RSF and JCD) initially screened and identified studies based on the study title and abstract. Duplicates and articles failing to meet inclusion criteria were removed. The remaining full-text articles were reviewed by RSF and JCD to determine eligibility. Any disagreements were resolved by a third reviewer (TL-A). Two raters (RSF and JCD) independently extracted data from all articles included; discrepancies were discussed and reviewed by a third party (TL-A). Data were extracted from the included articles using a custom data extraction form developed by RSF and JCD. We extracted the following categories: (1) study design; (2) participant characteristics, setting and length of follow-up; (3) measure of exposure (ie, sedentary behaviour); (4) measure of outcome (ie, cognitive function) and (5) main findings. For exposure measures (ie, sedentary behaviour), we extracted the (1) instrument name; (2) exposure definition (eg, sedentary behaviour or television time); (3) method of exposure assessment (eg, self-report questionnaire, accelerometry, etc); (4) data collection procedure; (5) statistical methodology and (6) previously established validity and reliability of the instrument. For exposure definitions, sedentary behaviour included time spent engaging in activities with an energy cost of ≤1.5 METs and television time referred to sedentary time spent watching television. For methods of assessment of cognitive function, we extracted the (1) instrument name; (2) domain of cognitive function assessed; (3) method for assessing cognitive function; (4) statistical methodology and (5) previously established validity and reliability of the instrument. Given the limited number of studies available and the heterogeneity of samples used in these studies, we did not perform a meta-analysis. Two authors (RSF and JCD) assessed the quality of the articles via the Strengthening the Reporting of Observational Studies in Epidemiology (STROBE) guidelines.22 The STROBE checklist contains 22 separate items to identify the quality of reporting for observational studies. In summary, we assessed study quality based on the following components: (1) an informative and balanced abstract; (2) clear scientific background, rationale, objectives and hypothesis; (3) clear description of study design, methodology, outcomes and exposures, and statistical analyses; (4) clear description of potential biases and how these were limited; (5) clear description of study participants, incidence of loss to follow-up and reporting of outcomes and exposures; (6) clear reporting of all results and analyses; (7) clear summarisation of study findings with reference to study objectives; (8) clear description of the limitations of the study and (9) a cautious overall interpretation of the findings with reference to the generalisability of the findings. Two raters (RSF and JCD) independently rated the quality of the studies and achieved consensus through discussion (Κ=0.90). Discrepancies were settled by a third author (TL-A). We used a binary system (+=Yes, −=No) for each item of interest on the STROBE checklist. High-quality studies were defined as studies missing fewer than three criteria of the STROBE checklist, while low-quality studies were defined as studies missing three or more criteria. Study characteristics are described in table 1. Three studies used a cohort design,23–25 one was a nested case-control design,26 one used a case-control design27 and three studies used a cross-sectional design.27–29 The average follow-up time for the cohort studies was 7.67 years,23–25 and the follow-up time for the nested case-control study was 21 years.26 Sample sizes ranged from 125 to 6359 participants with samples from England, Finland, France and the USA. A single study28 used an accelerometer, the ActiGraph GT3X+,40 to measure sedentary behaviour objectively. Accelerometers show good evidence of validity;48 ,49 however, there is no current minimum wear standard for reliable sedentary behaviour estimates. Our results indicate sedentary behaviour is associated with reduced cognitive function over the lifespan. Importantly, all four of the high-quality studies found sedentary behaviour is associated with poorer cognitive function. However, the heterogeneity in the current methods used to quantify sedentary behaviour and cognitive function is the major barrier to determining the precise magnitude of this relationship. We also found only one study used an objective measure of sedentary behaviour and a number of exposure measures lacked evidence of validity and reliability. Furthermore, two of the three longitudinal studies had follow-up periods of <10 years, which may account for the significant findings at baseline but not over time.23 ,25 Changes in cognition occur gradually over the adult lifespan,56 often with detectable changes occurring after the age of 60.57 As such, studies with short-term follow-ups (ie, <10 years) may not detect meaningful associations between changes in cognition and lifestyle behaviours. In addition to our findings, a plausible mechanism by which sedentary behaviour is associated with cognitive decline is emerging. Recent data suggest prolonged sedentary time impairs glucose and lipid metabolism,59 which are both recognised as risk factors for cognitive decline and all-cause dementia.60 ,61 There is also evidence that sedentary behaviour is related to cognitive decline by analogy. Briefly, sedentary behaviour is associated with many chronic diseases14 ,15 ,16 ,62 which are also associated with cognitive impairment and dementia risk.63–65 Thus, the evidence collectively suggests sedentary behaviour is a risk factor for later-life cognitive impairment and all-cause dementia risk. Finally, the construct of sedentary behaviour was misclassified in several of the studies. For example, Kivipelto et al26 categorised participants as sedentary based on self-reported leisure-time physical activity of less than twice per week. Yet, the absence of physical activity does not define sedentary behaviour,14 and thus misclassification in the literature poses challenges to accurately assessing the association between sedentary behaviour and cognitive function. While the current measurement of cognitive function in the studies reviewed appears to be more rigorous than the methods used to assess sedentary behaviour, there are still concerns. First, the numerous measures of cognitive function currently in use are obfuscating the relationship between sedentary behaviour and cognition. The eight studies we reviewed used a total of 13 measures of cognitive function. Specifically, the studies assessed memory by six different tests, executive function by four tests, processing speed by two methods, cognitive impairment by two methods and global cognitive function by three methods. With such a wide variety of measures used to assess each domain of cognitive function, comparing study results is extremely difficult. On the basis of the heterogeneity of measures, we recommend future studies use the following instruments for each domain of cognition to allow comparisons across studies: (1) RI-48 for memory; (2) Trail Making Task for executive function; (3) immediate word recall for processing speed; (4) the Rey-Osterrieth Complex Figure Copy and Recall Test for perceptual organisation and planning and (5) the Montreal Cognitive Assessment (MoCA)75 for global cognition. In addition, the numerous domains of cognition being assessed (ie, global cognition, memory, executive function, etc) prevent comparisons of study results. Few studies tested similar domains of cognition, and thus it is unclear if sedentary behaviour is associated with decrease in global cognitive function, several different domains of cognition or just a single domain. Future studies therefore need to first determine which domains of cognitive function decrease with increased sedentary behaviour. One means of potentially assessing all domains of cognitive function concomitantly would be the use of the NIH toolbox,76 which could independently examine the associations of sedentary behaviour with memory, executive function, and so forth. Several of the measures used to assess cognitive function in these studies also lacked evidence of validity or reliability, and thus the conclusions may not be valid for the construct the authors planned to investigate.77 For example, Hamer and Stamatakis23 used a memory test (ie, delayed word recall) without evidence of validity or reliability; thus, rather than measuring memory, the test may be related to another construct, such as executive function. While there are some issues with measurement of cognitive function in these studies, our preliminary findings suggest sedentary behaviour is negatively associated with memory, executive function and global cognition. These findings suggest sedentary behaviour has a similar association with cognition as exercise and moderate-to-vigorous physical activity. Moderate-to-vigorous physical activity, as well as aerobic and resistance exercise, is well documented to affect multiple domains of cognitive function.78 Furthermore, moderate-to-vigorous physical activity and exercise are established as an all-cause dementia prevention measure which could reduce the incidence of all-cause dementia by as many as 1 million cases worldwide.79 Given this information, sedentary behaviour may be adversely associated with the same neurophysiological pathways as moderate-to-vigorous physical activity and exercise. The STROBE checklist for observational studies is designed to ensure important information on study design is available, so readers of research can follow what was planned, what was done, what was found and what conclusions can be drawn.22 This information is an important component for systematic reviews;80 ,81 however, when components required by the STROBE guidelines are absent, the conclusions which can be drawn from these studies suffer. The quality of studies we reviewed varied greatly with several of the studies showing multiple flaws in reporting. Only one study24 met all criteria of the STROBE, and several studies were missing multiple criteria. Issues such as sampling bias, selection bias, recall bias and detection bias may therefore have inflated the results of these studies. We therefore recommend future investigations on how sedentary behaviour is associated with cognitive function firmly adhere to the STROBE guidelines. Finally, the lack of a sample size calculation by any of the studies we reviewed is an important concern. Sample size calculations for observational studies require a compromise between balancing the needs of power, economy and timeliness.82 Failure to attain a sample size with enough power inevitably leads to type II error; however, equally erroneous is using a sample size that is ‘too big’ that detects an effect of little scientific importance.83 For example, one study we reviewed included well over 6000 participants23 which may have accounted for the significant, albeit small, results. Current physical activity guidelines offer a brief policy recommendation on sedentary behaviour—avoid it as much as possible;84 ,85 however, in order to best promote healthy cognitive ageing, an empirically derived public health message is still needed. Thus, we have developed healthy cognitive ageing guidelines for sedentary behaviour which are in line with current evidence and recommendations.17 ,18 ,85 ,86 We therefore recommend all adults should (1) avoid sedentary time wherever possible; (2) limit discretionary sitting time to <2 h/day; (3) stand up and move after 30 min of uninterrupted sitting and (4) increase light-intensity activity (ie, standing and light walking) to >2 h/day by substituting these activities for sedentary time (eg, stand while watching television). This review only investigated observational studies on how sedentary behaviour is associated with cognitive function; however, to our knowledge, this is the first systematic review to evaluate the evidence. There may also be a publication bias which limits the generalisability of our findings; however, this limitation is inherent in all systematic reviews. Our systematic review located only eight studies, but our findings do show a consistent relationship that sedentary behaviour is associated with poorer cognitive function. Although all four high-quality studies found sedentary behaviour is associated with poorer cognition,23–26 more high-quality studies are needed before estimates can be made about the attributable risk of sedentary behaviour to cognitive impairment and all-cause dementia. Given this area of research is still developing, our study only provides an initial platform for examining the association of sedentary behaviour with cognitive impairment and all-cause dementia. Our preliminary recommendations for healthy cognitive ageing are therefore broadly consistent with current policy17 ,18 ,85 ,86 and may need to be refined as more evidence emerges. Dementia is also a complex disease which has several forms including Alzheimer's disease and vascular dementia, which have vastly different aetiologies. While the mechanisms may be different by which the different subtypes of dementia occur, there are certainly similarities in terms of risk factors. For example, Laurin and colleagues found increased moderate-to-vigorous physical activity was associated with reduced risks of cognitive impairment and dementia of any type.87 Thus, our preliminary findings suggest reduced cognitive function and increased all-cause dementia risk are associated with a sedentary lifestyle. Future studies should determine the associations of sedentary behaviour with different types of dementia. Related to this issue, different types of sedentary behaviour may have different associations with cognitive function. For example, there is some evidence that computer use may positively affect cognitive function in later life.24–26 However, since only eight studies assessing sedentary behaviour were included in this review—and only three studies24–26 assessed computer use as an exposure variable—it would be difficult to make comparisons and draw conclusions from the available literature. Future studies are therefore needed to determine how different sedentary activities, such as computer use, moderate the relationship between sedentary behaviour and cognitive function. The current body of evidence suggests sedentary behaviour is negatively associated with cognitive function; however, the associations between sedentary behaviour and cognitive function are complex and largely dependent on the exposure variable and outcomes assessed. Nonetheless, our findings suggest reducing discretionary sedentary time to <2 h/day and concomitantly engaging in ≥150 min/week of moderate-to-vigorous physical activity may best promote healthy cognitive ageing. Determining the association of sedentary behaviour with cognitive function could help guide public health policy on how to best promote healthy cognitive ageing. Our results indicate greater amounts of sedentary behaviour are associated with reduced cognitive function over the lifespan. Limiting discretionary sedentary behaviour to <2 h/day and concomitantly engaging in ≥150 min/week of moderate-to-vigorous physical activity may be crucial to maintaining cognitive health throughout the lifespan. This work was supported by funding from the Jack Brown and Family Alzheimer Research Foundation Society. RSF is funded by the University of British Columbia Rehabilitation Sciences Doctoral Award. JCD is a Canadian Institutes of Health Research postdoctoral fellow. TL-A is a Canada Research Chair in Physical Activity, Mobility and Cognitive Neuroscience. World Health Organization. Dementia: a public health priority. Geneva, Switzerland, 2012:112.
. Sedentary death syndrome is what researchers now call America's second largest threat to public health. Medical Pharmacology and Physiology publications (MU), 2001.
. The effects of physical activity and sedentary behavior on cognitive health in older adults. J Aging Phys Act 2005;13:294–313.
. WAIS-R manual: Wechsler adult intelligence scale-revised. Psychological Corporation, 1981.
. Delis-Kaplan executive function system (D-KEFS). Psychological Corporation, 2001.
. Memory evaluation with a new cued recall test in patients with mild cognitive impairment and Alzheimer's disease. J Neurol 2005;252:47–55.
. Neuropsychological assessment. Oxford university press, 2004.
. Reliability and validity of the Sedentary Behavior Questionnaire (SBQ) for adults. J Phys Act Health 2010;7:697–705.
. Reliability and validity of CHAMPS self-reported sedentary-to-vigorous intensity physical activity in older adults. J Phys Act Health 2012;9:225–36.
. Benton visual retention test. San Antonio, TX: Psychological Corporation, 1992.
. Neuropsychological testing. Oxford: University Press, 1995.
. A compendium of neurological tests. 2nd edn. New York: Oxford University Press, Inc., 1998.
. When does age-related cognitive decline begin? Neurobiol Aging 2009;30:507–14.
. The environment and disease: association or causation? Proc RSoc Med 1965;58:295–300.
. Measurement concepts in physical education and exercise science. Human Kinetics Books, 1989.
. The projected effect of risk factor reduction on Alzheimer's disease prevalence. Lancet Neurol 2011;10:819–28.
. Meta-analysis Spurious precision? Meta-analysis of observational studies. BMJ 1998;316:140–4. Physical Activity Guidelines for Americans. Bethesda, MD: National Institute of Health, 2008:76.
. Sedentary behaviors and subsequent health outcomes in adults a systematic review of longitudinal studies, 1996–2011. Am J. Prev Med 2011;41:207–15.
. Physical activity and risk of cognitive impairment and dementia in elderly persons. Arch Neurol 2001;58:498–504. Contributors RSF wrote the first draft of the manuscript. JCD provided help with article review and drafting of tables. TLA and JCD conceived the study concept and design. TLA and JCD wrote portions of the manuscript and critically reviewed the manuscript. Funding Jack Brown and Family Alzheimer Research Foundation Society.